Comfortable, Quiet motor weighing 138gms,wih rechargeable battery having one and half hour long operation possible. 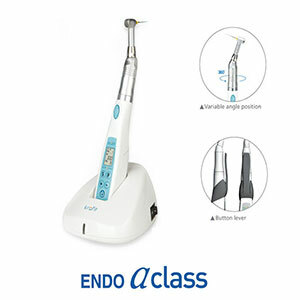 Marathon Endomotor A (Reciprocating) Class by Saeyang is a cordless endomotor suitable for endodontic procedures. It has a reciprocating system that stops the motor from running once it is overloaded. The two modes, Forwards and Reverse reciprocating modes facilitate this mechanism by a repeatable back and forth motion. The auto stop reverse feature of the endomotor ensures that the motor stops running once it is overloaded and subsequently runs in the reverse direction until the load is solved. Once the load is solved the motor starts running in the forward direction. The push type miniature head aids in easy replacement of rotary files and visibility of the operating area. There are 6 memory programs assigned to the endomotor. The motor on/off button can be used to change to the reciprocating system by pressing it for 2 seconds. The LCD display shows the mode of operation, the program number, speed of rotation and the torque. The Endomotor A Class runs on a Ni-MH battery which allows 90 minutes of use.